There’s always good news coming from the House of Mouse, and here’s some for your little ones. 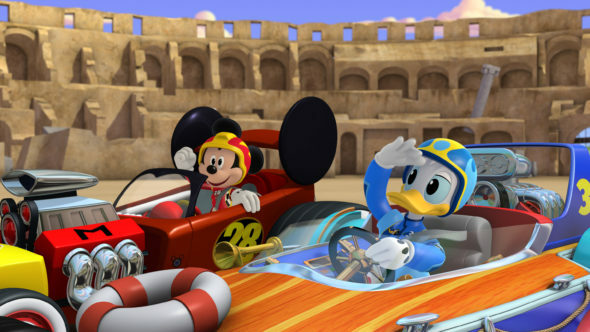 Disney Junior has renewed its animated Mickey and the Roadster Racers TV show for a third season, with a start date TBD. The early season three renewal comes just a month shy of the Mickey and the Roadster Racers season two premiere, on Friday, April 13, 2018 at 9:30am ET/PT. Real-life racers Danica Patrick and Jeff Gordon are returning for season two of Mickey and the Roadster Racers , along with Jay Leno, Jane Leeves, Kate Micucci, Tia Carrere, and Patton Oswalt. The second season guest star voice cast also includes Guillermo del Toro, Alice Cooper, Mario Andretti, Stephen Fry, Sabrina Carpenter, Camilla Belle, Andrea Martin, Takuma Sato, and Pippa Mann. Learn more from this Disney Junior press release. Disney Junior has ordered a third season of the animated “Mickey and the Roadster Racers,” Disney Channel’s #1 series among Kids 2-5. Production will continue as season two of the hit series – with a remarkable guest cast throughout – debuts FRIDAY, APRIL 13 (9:30 a.m., EDT/PDT) on Disney Channel. New episodes will also be available on the DisneyNOW app and Disney Junior VOD that day. The guest voice cast for season two includes: Academy Award®-winning director and writer Guillermo del Toro as Mr. Talbot, business partner to Goofy’s world-adventuring Uncle Goof; rock legend Alice Cooper as treasure hunter Alistair Coop De Ville; racing icon Mario Andretti as Mickey’s racing teammate Mario Mousedretti; actor and comedian Stephen Fry as English gentleman Dr. Crutchley; recording artist Sabrina Carpenter as pop star Nina; Camilla Belle (“Diablo”) as Daisy’s Brazilian cousin, Almanda; Broadway’s Andrea Martin as Mrs. Bigby, a stylish pink poodle; and Indycar drivers Bia Figueiredo, Takuma Sato and Pippa Mann as international race car drivers. Returning this season are Jay Leno as Billy Beagle; Patton Oswalt as Mr. McSnorter; Jane Leeves as the Queen of England; Danica Patrick as race car driver Danni Sue; Jeff Gordon as race car driver Gordon Gear; and Kate Micucci as Emmy Lou. Since its Jan. 2017 premiere, “Mickey and the Roadster Racers” has reached over 157 million viewers worldwide and is available in 158 countries in 32 languages. 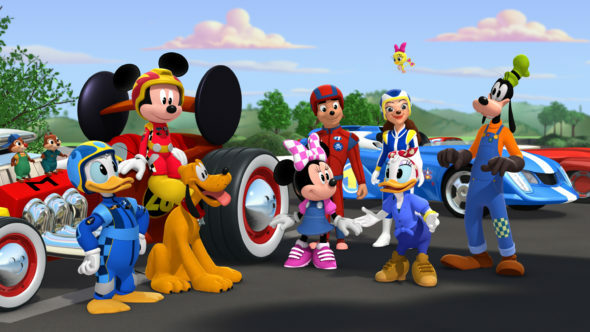 The series takes Mickey and the gang, along with their unique transforming vehicles, on humorous high-spirited races around the globe, as well as hometown capers in Hot Dog Hills. Off the racetrack, Minnie and Daisy also run their own successful business as Happy Helpers solving problems for anyone in need of a helping hand. The stories are designed to impart social and emotional lessons about friendship, teamwork, optimism and good sportsmanship. Season two finds the gang enjoying upgrades to their personalized race cars, making them glow-in-the-dark and speedier. “Mickey and the Roadster Racers” is featured in the “Disney Junior Dance Party On Tour” live concert experience, which launched March 14, and the popular “Disney Junior Dance Party!” attraction at Disney California Adventure. Additional brand extensions for the series include toys, storybooks, apparel, plush and home décor from Disney Consumer Products and Interactive Media, with new products debuting this fall. The Emmy®-nominated creative talent behind Disney Junior’s hit series, “Mickey Mouse Clubhouse” and “Jake and the Never Land Pirates,” comprise the production team: Rob LaDuca is executive producer, Mark Seidenberg is co-executive producer/supervising story editor, and Thomas Hart is story editor. The series is a production of Disney Television Animation. What do you think? Did your family enjoy the first season of the Mickey’s Roadster Racers TV show? Do you plan to tune in for seasons two and three on Disney Junior? Let us know, below. More about: Disney Junior TV shows: canceled or renewed?, Mickey and the Roadster Racers, Mickey and the Roadster Racers: canceled or renewed?